it doesn't seem that long ago that cycle mitts - which are seemingly always called track mitts even though most never see the inside of a velodrome - either had no padding worth speaking of, or minimal amounts of the stuff frequently in the wrong places. maybe we were tougher in them days, or simply not educated enough to know that the mitts were supposed to suppress all that road buzz. maybe that's why they invented carbon forks. but the world has moved on apace and our roadie hands are now cossetted to levels that those skinny little digits can scarcely believe. and those little handies have started to become a touch blase about their luxurious short finger coverings. summer is supposed to bring warm, dry weather (and for once, it actually has), probably not the ideal conditions for overworked and sweaty palms, but provision has been made. these latest summer weight mitts from prendas not only look the part, but have padding aplenty in just the right quantity and location. and because they're summer mitts, what's left of the palms after the padding has been taken care of is mesh. these really would suit those who generally prefer not to wear mitts at all in summertime, since the mesh allows almost gulpable quantities of fresh air about the palms; when retiring to the coffee stop, removal will display cool, calm and collected hands when grasping the handle of those oversize cappuccino cups. and just to aid removal, should such aid be needed, there are a couple of loops affixed to middle finger and little finger, allowing the mitt to come off right side out. the padded area, which includes the whole of the forefinger, has been ascribed the prendas logo in a rather inviting repeating pattern, and rather uniquely, there is an extended wrist flap making it easier to put them on in the first place, and providing extra protection for the base of the hand. 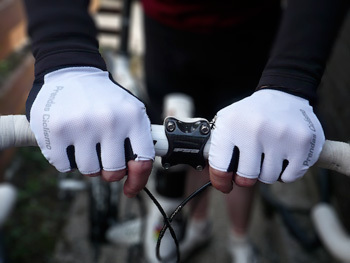 the back of the glove has not only the terry snot wipe on the thumb (exactly where it should be), but a stretchy lycra back that allows a pleasant freedom of movement. and just in case you forgot where they came from, the legend prendas ciclismo is inscribed in silver. prendas summer mitts are available in four colours and a variety of sizes for a very reasonable £29.95.